This post has been sponsored by Eggland’s Best, but as usual, all opinions are my own. Thank you so much for supporting my blog! 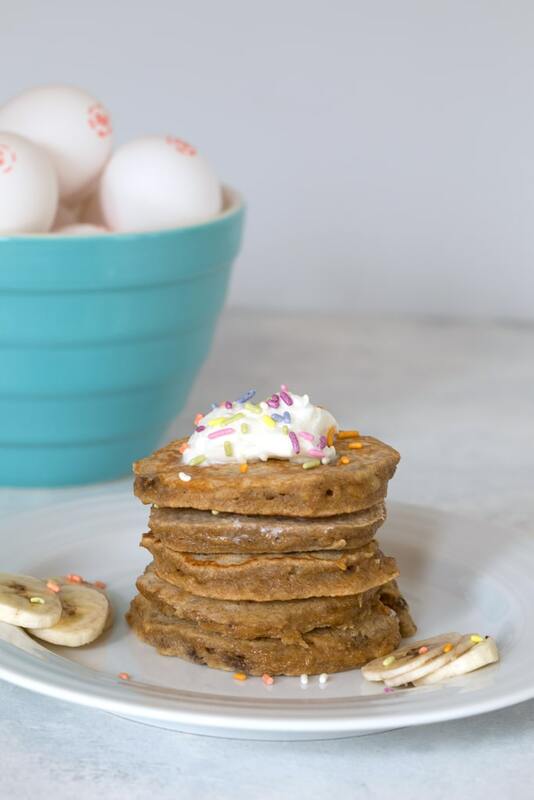 These Egg, Apple, and Banana Pancakes for Dogs will have your dog very excited for breakfast. The only downside is that your pup may start waking you up even earlier! Hello. It’s Friday and the perfect time to start planning your weekend breakfasts. Pancakes, anyone? Oops, I’m sorry, but unfortunately, these pancakes are not for you. I’d feel bad, BUT Saturday is National Dog Day and you should be putting your dog’s needs ahead of your own (unless you’re like me and you already do that every day). Don’t have a dog? Well, um, I recommend adding a little bit of sugar and vanilla to this pancake batter and enjoying this breakfast yourself. 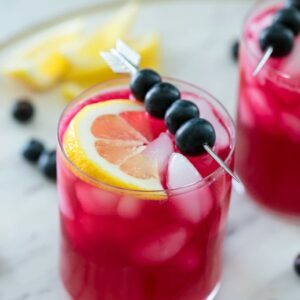 Or just consider them a healthier version of your regular pancakes so you can feel good about celebrating Whiskey Sour Day later on in the evening (LOL, really though). 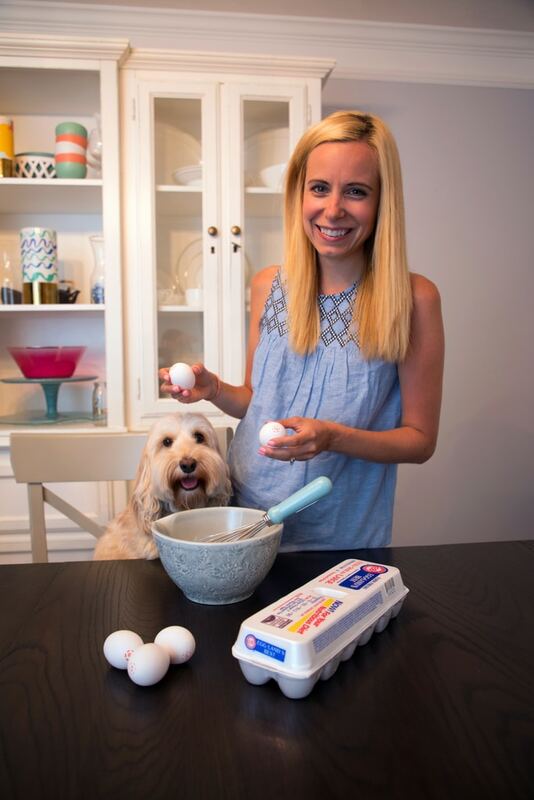 I’m a ridiculous person and pretty much treat every day like National Dog Day, but this year is extra special because Winnie and I are celebrating with Eggland’s Best. We actually did our main celebration yesterday when we took over their Instagram Stories feed to make two fun dog-friendly recipes. I’m sharing the first of those here with you today… Egg, Apple, and Banana Pancakes for dogs. I’ve said it before and I’ll say it a million times in the future I’m sure, but my dog is the BEST. I’ve always been a crazy dog person (I was bit by several dogs as a child because I was always up in their faces trying to love them) and I was obsessed with my childhood dog, but I never thought I would love this pup like I do. It’s borderline a problem, but I’m just going with it for now because she makes me so happy. 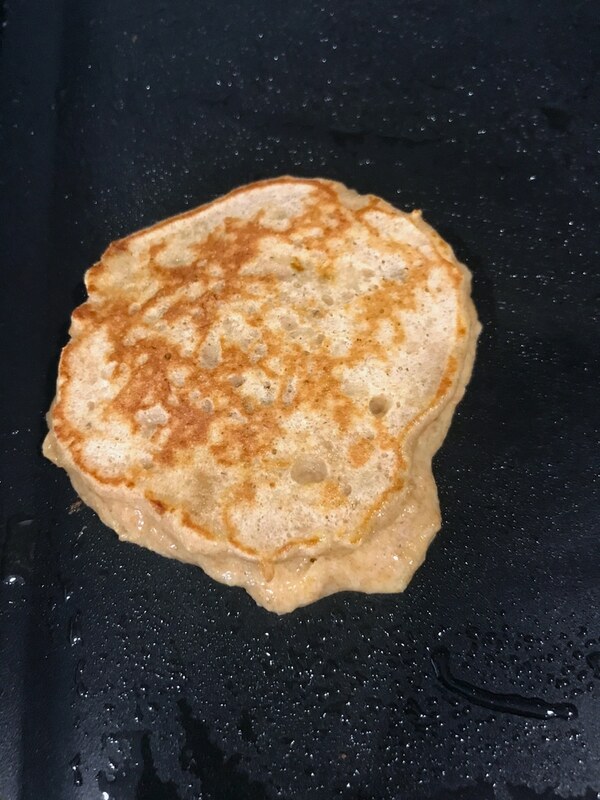 For our first recipe, we decided on egg-based pancakes with a little bit of whole wheat flour and mushed banana and grated apple. Just five ingredients total; super simple and healthy! I think I could probably win some awards for worst-shape pancake maker… But the good thing about cooking for dogs is that they really don’t care about the shape of the food. They’d prefer it to just be ready as quickly as possible. Luckily, these pancakes take just minutes to prepare! 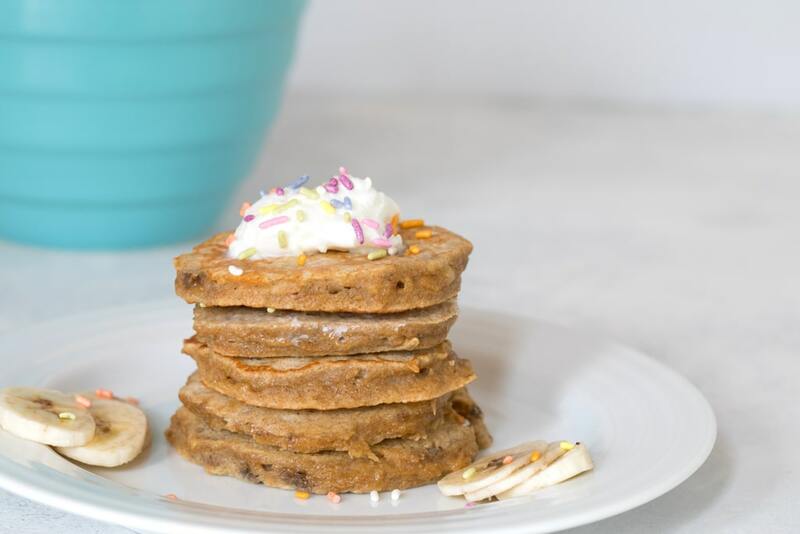 If you’re feeling fancy, you can top the pancakes with some whipped cream and sprinkles. I just whip a little heavy cream and don’t add sugar or vanilla. And my sprinkles are naturally-colored as I don’t want to feed Winnie anything artificial. Don’t the whipped cream and sprinkles make this feel like such a special breakfast? In honor of National Dog Day, a little extra celebration is a must. 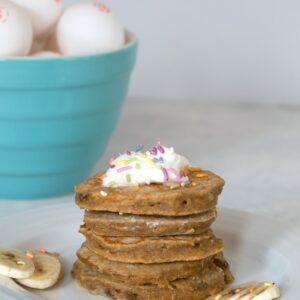 While whole wheat flour can sometimes make pancakes a bit dense, the two eggs in this recipe really lighten things up for a great consistency. Like I mentioned, these are obviously pancakes for dogs, but as you can see from the ingredients, they’re totally OK for humans, too. 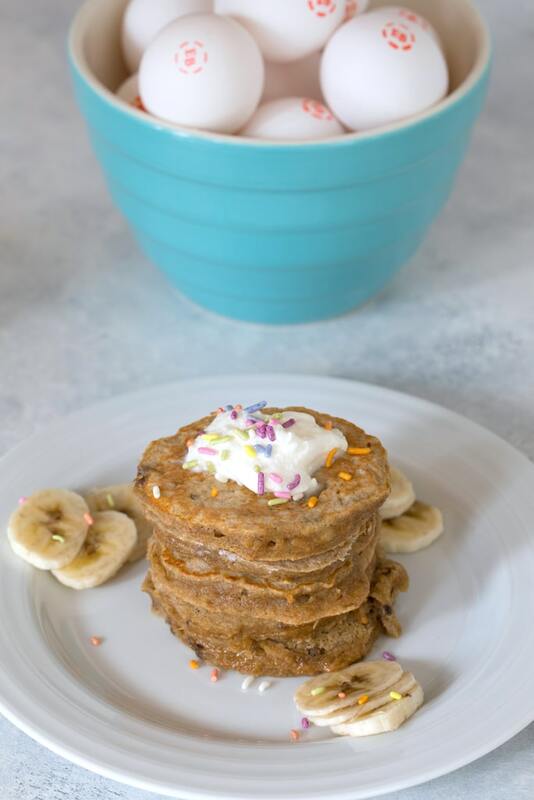 In fact, they’re likelier way healthier than the pancakes you usually eat. I think they’re super tasty and have enough flavor from the banana and apple pieces, but they could probably benefit from a little sugar and/or vanilla if you prefer. Or just a nice healthy dose of maple syrup! 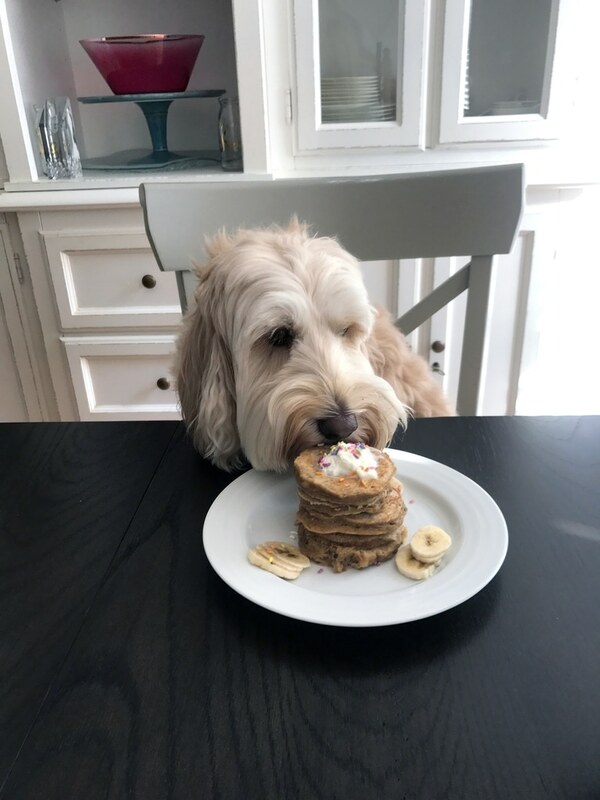 This pancake stack is fit for a queen pup! Not that I let Winnie eat an entire stack of pancakes… Though she would have if I let her. She must have thought she had died and gone to heaven when she saw this stack in front of her and she didn’t hesitate just digging right in. Do you blame her? Don’t you hate when your beard gets in the way of your pancake eating? The struggle is real, my friends. And that’s only the first recipe! 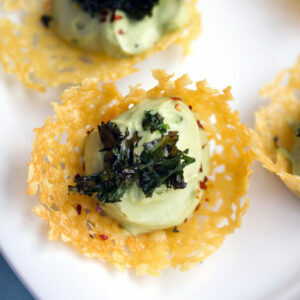 I’ll be sharing my second recipe (Ham and Cheese Sweet Potato Egg Cups) with you soon. In the meantime, make your pup some pancakes for dogs and snuggle them extra tight on National Dog Day. Oh! 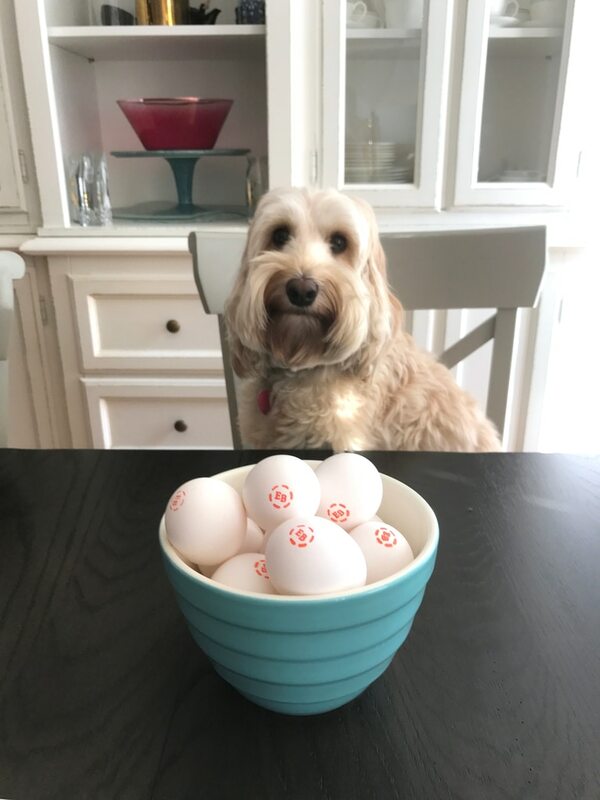 And enter Eggland’s Best’s Pup Star 2 Sweepstakes… You could win some really cool prizes, like a trip to Florida, travel packs, bikes and more. 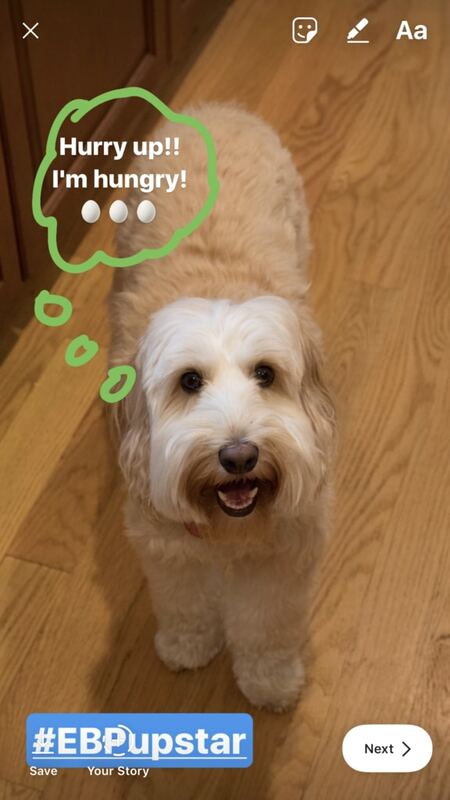 If you have a dog, do you treat him or her with homemade treats? 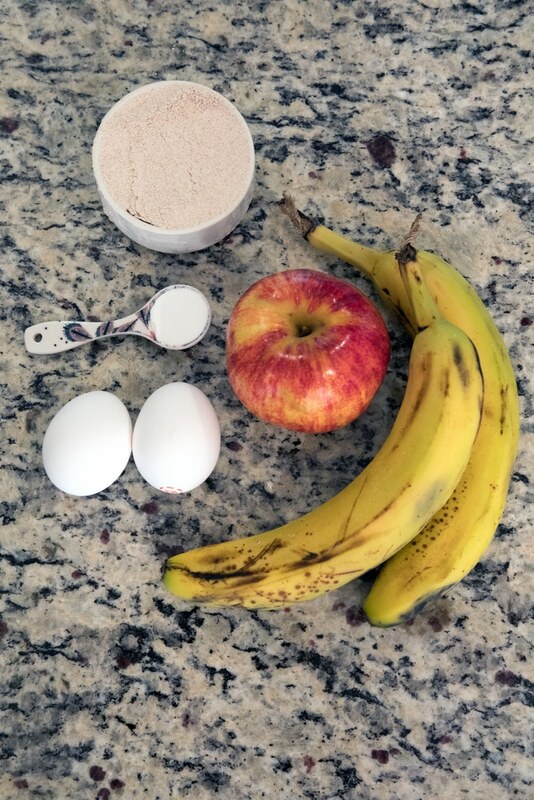 In a large bowl, mix together mushed banana, grated apple, and egg, until well combined. In a separate medium-sized bowl, whisk together whole wheat flour and baking powder. Gently stir dry ingredients into wet ingredients until just combined. Lightly butter a skillet over medium heat and pour about 3 Tbsp of batter onto the skillet. Cook pancake for about 2 minutes on each side. 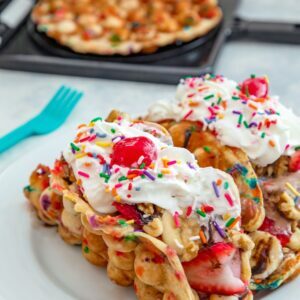 Top pancakes with whipped cream and sprinkles, if desired. 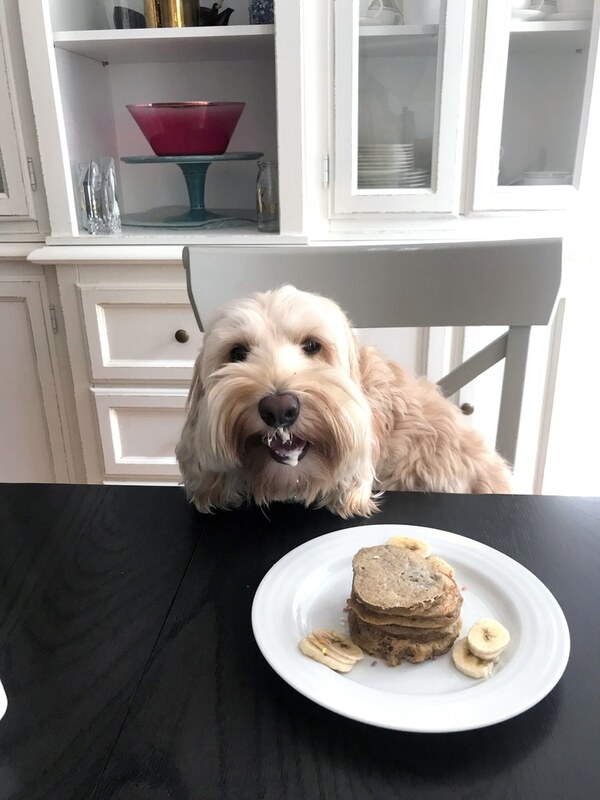 19 Responses to "Egg, Apple, and Banana Pancakes for Dogs"
What a beautiful and happy dog!! Oh my goodness! 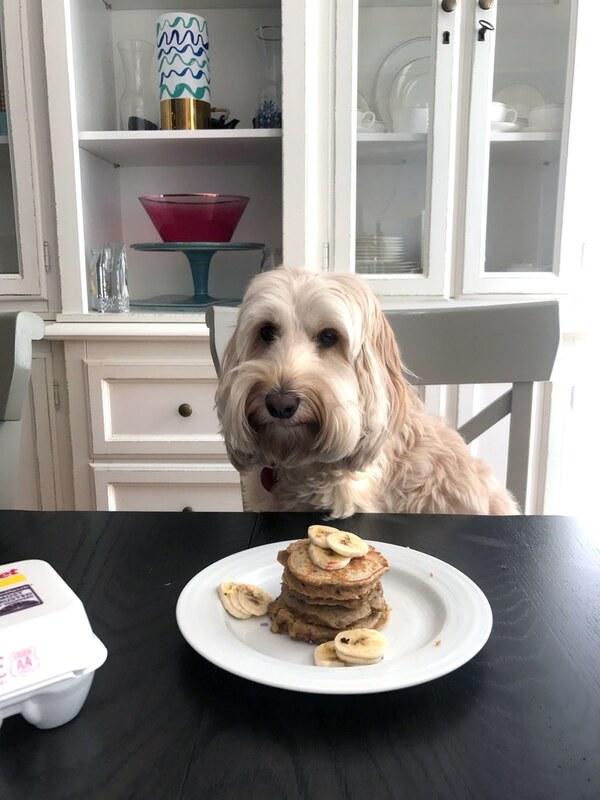 She is such a cutie pie and definitely one lucky pup to have a stack of pancakes made for her! I can’t wait to see what you make for her next 😉 ! Your photos are so adorable! OMG so many squeals. Aww, your dog looks sooo cute! Cute puppy — and very spoiled. My husband doesn’t get pancakes on the weekend! That is one happy dog! And seems like you treat your dog much better than I do my poor husband. Pancakes are a rare affair, if that. I saw on IG that you took over the Egglands Best account! Congrats! That’s so fun!! Speaking of fun – these doggie pancakes!! OMG, I LOVE THESE! Those photos of Winnie with her stack of pancakes are just THE CUTEST thing EVER! I totally need to make these for my fur baby! Cheers, doll! This is so adorable. I haven’t had a dog for a couple of years but we’re recently thinking of changing that!! Your dog looks like she’s in heaven!! So sweet. How fun are these doggie pancakes?! My fur baby would flip over these! And I love how easy they are to make, too. Such a fun treat! Adorable! My dog would love these pancakes. Winnie IS the CUTEST!!! I love all the pics – she’s very photogenic and she deserves special pancakes – how fun! 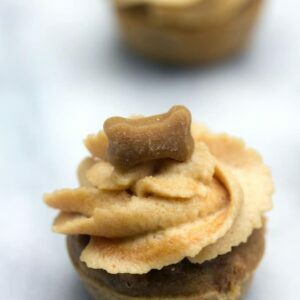 Absolutely the most creative & yummiest for pups of all ages!! Splendid post, Sues! Can I use hungry Jack pancake mix ?